Have you been watching it? I love it. I cannot get enough of it. I wasn't sure what to expect after loosing interest quickly after the first series had begun, but I thought I would give this one a chance. I'm glad I did. I am in love with Lynda and would really like for her to win. She just seems like such a lovely, down to earth lady and I love her cheekiness too, she is a real character. They all seem like a really good bunch this year. I've really been enjoying sitting down each week to watch it. Even James has been getting into it hehee. We only have the one TV so we have no choice but to sit and watch what the other is watching. Luckily neither of us are too bothered by TV, we could go a few days without turning it on and wouldn't think much of it. Up until this week I feel that the right person has gone from the sewing room, I'm not so sure I feel the same about tonight's though, but I won't say anything, I don't want to ruin it for those of you who may not have seen it yet. 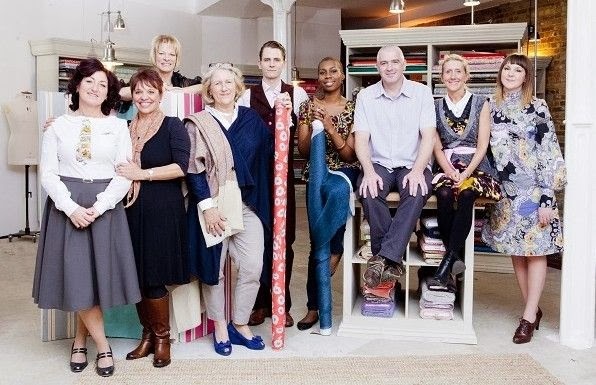 So now all there is to do is wait a whole week for the next stage of the Sewing Bee and to see who goes out next. Hi Gem, ooh I love it too! I missed the middle last night because I had to go and pick Millie up from college, and I don't have new fangled things such as Sky!